Click here to see an album of some of our favourite photos from Stars & Snowdrops. We do ask visitors to Stars & Snowdrops to be considerate when parking along the village street: please do not obstruct accesses to houses, private driveways, etc. We are very confident that the great majority of our visitors would never do such a thing but there have nevertheless been a few instances of this in the past. Your cooperation will be much appreciated. 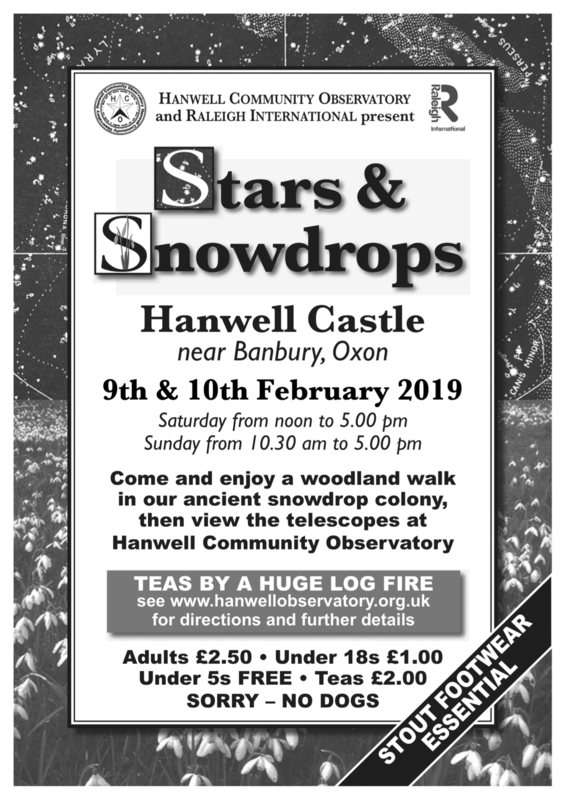 Stars & Snowdrops is our annual fundraising weekend. First held on the 12th and 13th February 2005, this event was designed to make both the observatory and the grounds accessible to the general public while construction of the Millennium telescope was in progress. 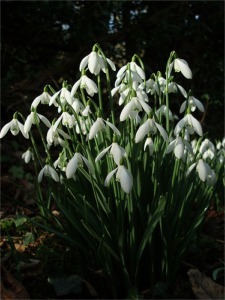 It has been held every year since and is now a fixture for the second weekend in February as the snowdrops come into full bloom. Raleigh International bring a band of volunteers every year to work on improving access paths to the observatory and maintaining the scenic woodland walkways. Visitor numbers have increased steadily since 2005, with over 1200 attending in 2008. The event is now a major attraction in the locality, particularly for families, and has been well covered in the local press. 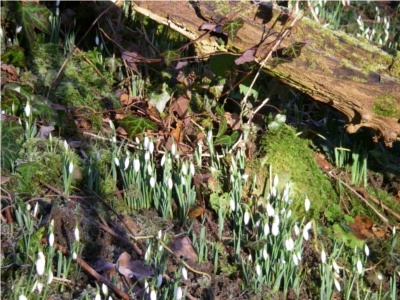 People have come from far and wide to enjoy the outdoors early in the year as the snowdrops herald the coming of Spring. HCO members are on site all weekend to demonstrate the working of the telescopes and discuss the future of the Observatory project. A display of photographs shows the development of the project as well as astronomical images taken with HCO instruments. Members are very happy to give advice on buying or using telescopes. In February 2008, HCO borrowed a Coronado PST solar telescope from the Stratford Astronomical Society, delighting visitors with excellent views of solar flares and prominences. A warm welcome awaits tired walkers at the house, with tea and homemade cakes by a roaring log fire. The event is hard work for HCO and Raleigh, but the atmosphere is relaxed, homely and rewarding for all. 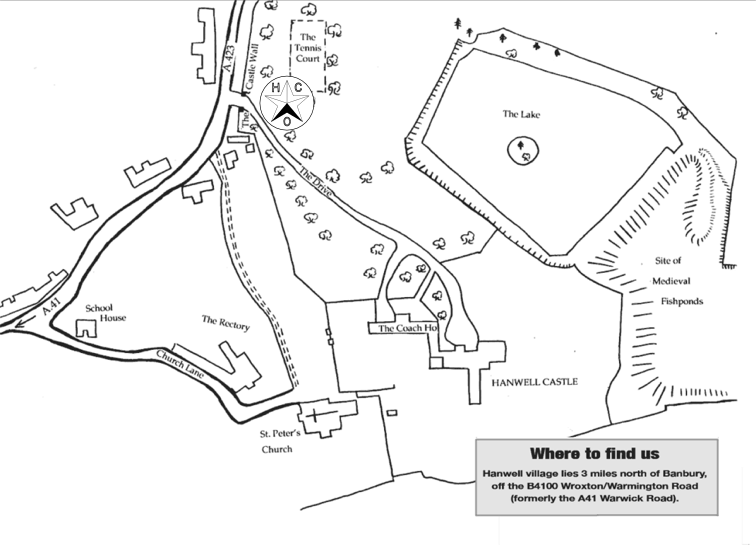 Archaeologist Stephen Wass, who has embarked on a five year project to uncover the lost gardens of Hanwell Castle, will also be at the event to talk about his research. The proceeds from Stars and Snowdrops are divided equally between HCO and Raleigh. To date, the event has raised over £10,000 for HCO. The money is being used for futher work on the observatory and in 2008, a substantial investment was made in purchasing a solar telescope of our own. No booking is required, so just turn up on the day! We often receive requests for copies of the poster to help publicise the event. You can download a copy here. We are really grateful for this support from the community, so thank you! We are indebted to Julie Godson who designed the event poster. We should also like to thank Tim Ellis and Stella Carr of Hybrid Arts for their help in the promotion of this event. We had an amazing weekend at Stars & Snowdrops 2015, with nearly one thousand visitors making it the second most successful Stars & Snowdrops in the history of HCO (beaten only by the two days of perfect sunshine in 2008)! Visitors enjoyed the beautiful snowdrop colonies (which were looking better than ever according to many visitors), saw the progress at the observatory, and had the bonus of discovering the history of Hanwell Castle's grounds with the ongoing archeology project around the site. Plus, of course, there were the delicious teas and cakes! Thank you to everyone who helped make the event possible, from those manning the tea urns to everyone who helped us to publicise the event on Facebook & Twitter! With great regret, we were forced to cancel Stars & Snowdrops 2014 due to the state of the woodland walk. January’s record rainfall meant that the snowdrop paths were unsafe for the number of visitors that Stars & Snowdrops generates. We were deeply sorry for having to do this, but it was the only safe option. However, we were able to use this as an opportunity to open up the castle grounds in autumn, with our one-off 'Galaxies & Gardens' open weekend in September 2014. Thanks to the hundreds of visitors to Stars & Snowdrops 2013. Everyone who came on the extra Sunday enjoyed the beautiful snowdrops, spectacular views of the sun and the moon and the delicious cake! 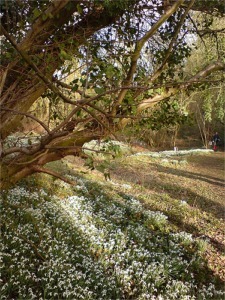 And a special thanks to everyone who braved the weather to come to Stars and Snowdrops the previous weekend. Despite the rain, over 100 visitors enjoyed the snowdrops, talking to the astronomers and, of course, the tea and cakes by the huge log fire! Thank you to the 600+ who came along this year despite the postponement and the bad weather on Saturday. Sunday's weather made up for the previous day and many visitors were delighted with the the views of the sun through the solar telescope and, later, Venus in the daytime sky! Thanks especially to the many members of the community and friends of friends who came out to support us when we had to shift the dates. We might have had to cancel otherwise, so it's heartwarming that you all volunteered. And thank you to Graham Whiting for this wonderful panorama (made with Autostitch) taken at the event! Click here to see a bigger version! Many thanks to Kerry and Alicia of Hybrid Arts for producing this video. Click here if you can't see it above. Snowdrops on the 1st of February 2010. 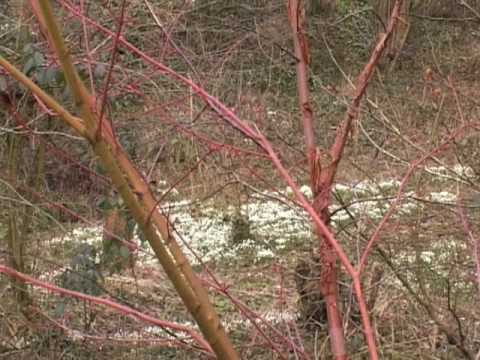 HCO hosted its fifth Stars and Snowdrops event over the weekend of 21st/22nd February 2009. Heavy snow had made it necessary to postpone the event from Valentine's weekend and we are indebted to the Banbury Guardian for help in getting the event moved. 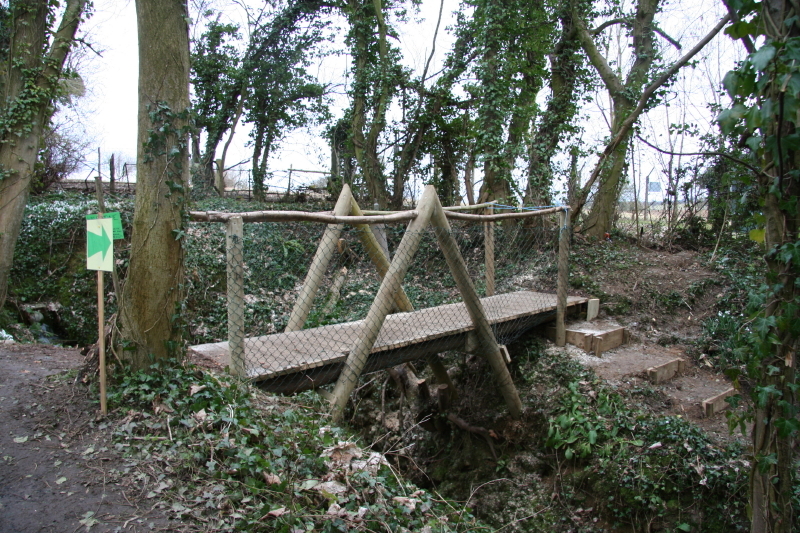 A team of 15 Raleigh International volunteers came on the 14th despite the snow and built a new bridge in the grounds - Valentine's Bridge - allowing visitors the following weekend a wonderful new view down into the wood. We had about 750 visitors over the two open days and we were very cheered by the enthusiastic response from those who visited, many having attended the event in previous years. The snowdrops were looking their best - the snow does not damage them at all - and because it was later than usual there was a good display of crocuses to be seen as well. 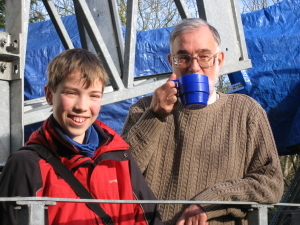 13 year old Oliver King from Banbury joined the other astronomers at the Observatory site on Sunday and did a superb and very dedicated job explaining the telescopes to inquiring visitors. 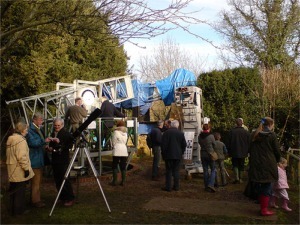 Andrew Baxter demonstrated the use of the Millennium telescope and invited visitors to "ride" it. Two of the smaller portable telescopes were on-site and the solar telescope afforded views of the Sun's disk, at least on Saturday. Huge quantities of tea and cakes were consumed, the atmosphere was extremely pleasant and the crowds were exceptionally careful and considerate. 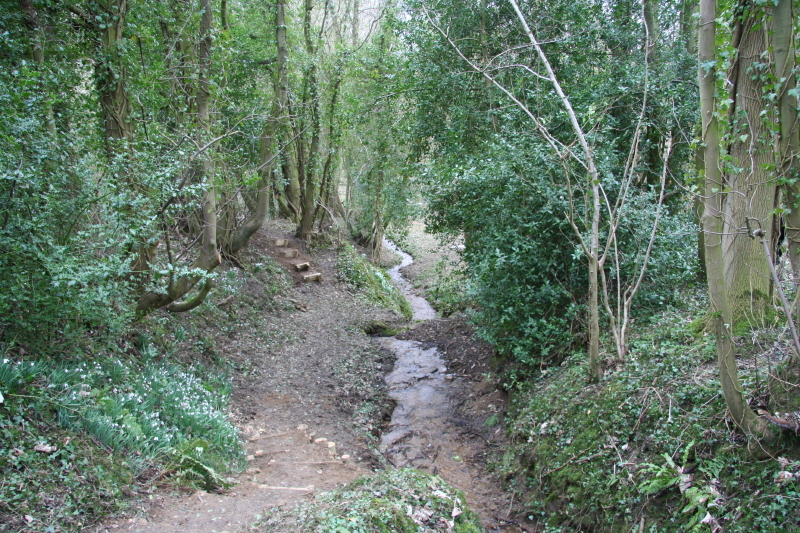 The view through the woodland from Valentine's Bridge.